We've all seen those AT&T ads over the past few months featuring dopey Luke Wilson taking jabs at Verizon, and as the battle played out over Verizon's "There's a Map for That" ads...including a few lawsuits. 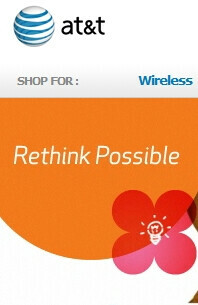 Now it appears that AT&T is looking to rebrand themselves with a new catch-phrase Rethink Possible. Esther Lee, Senior VP-Brand Marketing and Advertising for AT&T stated, "It's not going to be the old model that there's brand work, and then there's consumer work or enterprise work; it's all 'Rethink Possible'. All of our communications across all of these channels is 'Rethink Possible' and this integration of design." The first TV commercials to use the new branding was shown during The Master tournament which began this week. The desired result is to re-shape what people think of AT&T, away from a strictly telecommunications company to an innovation company. Ms. Lee further stated, "There's so much innovation happening at the company that I think people don't know. We spend an average $18 billion to $19 billion a year on our network, our technology and our inventions in order to drive the future of how people are going to live on our network." With the exclusivity deal ending this year between AT&T and Apple, and with other carriers expected to get the iPhone in time (such as Verizon), it is only natural for AT&T to rebrand as they want to "get past the competitive conversation and talk about what's in it for the consumers." There's no word yet on the fate of Luke Wilson, but he's also being used on new AT&T U-Verse commercials as well. "There's no word yet on the fate of Luke Wilson" ...make commercials better, don't use him anymore. Everybody knows him as a tool now. I think their ads went from bad to worse. I don't think ads have ever helped customer relations with a company. Again, Sprint is still suffering from their years of bad customer service even though as a company, it's one of the best and strongest to go with. AT&T frustrates me because it had everything. It had the AT&T name behind it...generations know of the AT&T name and they rode on that as if they were invincible. Now we see the name or brand isn't untouchable. Commercials isn't going to help it. People have to have proof that the network is better and the company as a whole is a better one. Verizon has done exactly what AT&T should have done. They have told their customers that they should be proud of their phone and their network and those customers are. Even though Verizon's network is no better than AT&T, they have a sense that it is because the Verizon name is behind it. It's hard trying to get that for a company that has been trashed for a good portion of a year. Isn't that the same consumers report that makes the ford fusion the best car whith the most quality..??? JOKE...!!!! Sorry for ya, money wasted on garbage......Still a joke...!!!! "We spend an average $18 billion to $19 billion a year on our network, our technology and our inventions in order to drive the future of how people are going to live on our network." That is great, but where is the damn video call function? China rolled out the 3G way later than AT&T. they already have the video call function, which is one of the all-purpose cellphone device can do with 3G. China doesn't have too many iphones using their network like AT&T, now u see why slow-rizon wireless is desperate to get it...!!!! Here's an idea ATT why don't you rethink possible giving people service before anything else. 1 bar for the past three days... Crazy. Off to verizon I go. lol if youre gonna call someone or something retarded make sure you spell it right. AT&T is not as bad as people make it out to seem. No one carrier is the best at everything. In certain areas, certain carriers work the best. It's just like people to quickly criticize AT&T because it's the most popular thing to do. If AT&T was such a bad company, then they wouldn't be the #2 carrier now would they? And many people are still going to AT&T, they're adding new customers everyday. I wish nothing but the best for AT&T. Yes, it's MY carrier and I like it! Thank you is easy to bash a company who's been a top for the longest, i'm glad verizon is on top right now let all the expectations be put in their hands, while everyone is anticipating on verizon next move ATT while be in the cut getting there ish 2gether which i know they will. I work for ATT and they will be back on top again, that's if they want to be.